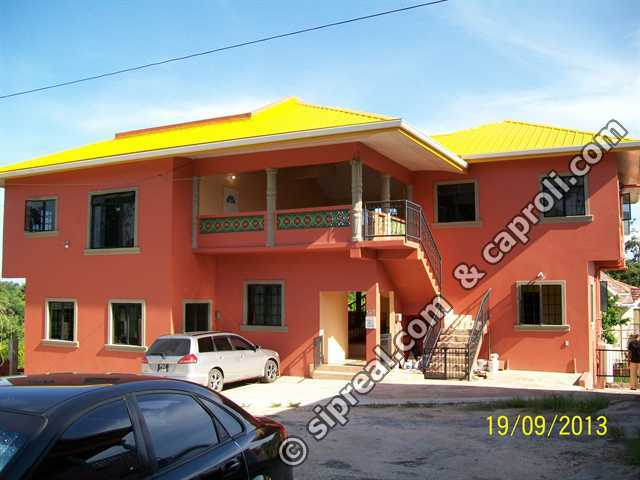 THIS RECENTLY CONSTRUCTED 6 APARTMENT BUILDING is located only a few minutes drive from Sunset Beach in Fanny Village, Point Fortin. The 3 storey building consists of 1 Studio Apartment, 3-two bedroom apartments and 2-three bedroom apartments, each with a kitchen and bathroom. The lot on which it sits measures 5,125 sq.ft. (476.2 sq.m. ), which has been levelled. The bottom floor, consists of the studio apartment and a 2-bedroom apartment, and a separate covered laundry area. The middle floor has a large open area giving access to 2-two bedroom apartments. The top floor also has a large covered open area and 2-three bedroom apartments. To the front and side of the building is parking for tenants. On top of the building is a lookout offering fantastic views of the surroundings. Some of the apartments are presently occupied, but if required all the apartments will be vacant at the time of closing. Amenities: Electricity, Water, phone, cell phone signal and Internet. Directions: I am going from the point of view that you know how to get to Fanny Village. On reaching Fanny Village coming from Point Fortin, you turn Left into Country Trace >> Turn Right at the "T" Junction >> Turn first Left >> Turn first Left again >> Turn first Right >> Drive uphill until you reach by a drop in the road where you also will see a "Y" junction keep left and continue uphill. On top of the hill the road makes a sharp 90 degree left turn. Follow road and turn right at the second street and right again at the first street. Drive to the end of the road and the property is on the left. PLEASE NOTE: Viewings from Mon. - Fri. and by appointment only. This listing has been viewed 2245 times. Our Agency only takes a select few property listings in Point Fortin and it's surrounding areas. FIU Registered (Financial Intelligence Unit).